I couldn’t work out what the sleeve was for really. Printed on rough paper, too big to fit inside an album cover, but too flimsy to be a shopping bag, it still looked interesting. Too interesting not to risk 50p on it. Even now I’m not 100% certain what it was used for, but my guess is a slip-case used by the EMG record shop to keep stock in. EMG then, not a name I knew, but as they were mainly a classical music shop this is no big surprise. 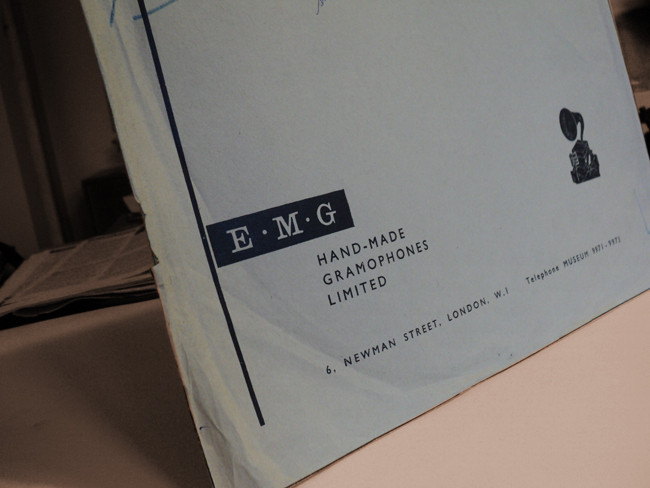 And there turned out to be an interesting and idiosyncratic history behind the name, as EMG started out life as gramophone makers back in 1924. And not just any gramophone either, but one which many reckon was the Rolls-Royce of early machines, using a hand-built sound box and massive papier-maché horn. When examples come on the market today they fetch thousands. The players were named after the developer E.M. Ginn, who promptly fell out with his business partner and went off to start a rival company, E.M. Ginn Gramophones. His original company prospered however and after opening a shop, soon began selling records. But not any record. They would only stock pressings and performances which they felt reached a certain standard! In the 1950s they began issuing a regular newsletters and catalogues of new titles “to assist connoisseurs who wish to add only the finest microgroove records to their collection”. The store relocated several times and seems to have closed around 1979. The bag design looks to be from the forties, and the store was certainly located at this address by 1951. I really like the little drawing of the record listener in the corner, though cannot make out the name of the artist. The sleeve still has the EMG stock details in coloured pencil at the top (you can an image at the link below), which shows that it housed an HMV recording of Verdi’s Il Trovatore, issued in 1961. A subsequent owner has used it to keep a copy of a Jeanette MacDonald soundtrack 78 rpm – I’m sure the staff at EMG would have had something cutting to say about that! While researching he name I stumbled across a fascinating reminiscence about record hunting in London back in the 1940s. Although the writer was looking for classical records, many of his comments will find an echo amongst record collectors everywhere, so I have reprinted some of it on the site. It does talk in particular about EMG. EMG The shop.